Plot Summary: A big trasatlantic ship, full of rich and important people for international business, has been taken by a group of terrorists. 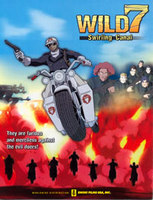 The only hope for their rescue is in the hands of a japanese man known as Japa, but first, he must hire seven companions to help him, and together they will be the Wild Seven. The main plot occurs in the waters of Nicaragua's Canal.